I’ve been back in my classroom for 2 days now, puttering about and getting things organized. I work in meandering circles through the room: a task here, a task there, part of something over here, but wait first that other thing needs to be done, but where are my scissors, and who took my recycle bin, and wasn’t my desk further away from the window before…? I have passing moments of mild irritation that I can’t seem to tackle classroom setup in a more systematic fashion, but I’ve also learned: it always feels like this, and it always gets done before the children arrive. There’s something magical about a classroom, and the “stuff” that goes into it. Think about it for a moment: a place constructed entirely for children: to be inviting and interesting and safe and soothing and stimulating, all at the same time. A place where adult “stuff” — furniture, supplies, materials — is incidental, almost an afterthought. There’s magic in the metamorphosis of our rooms every year – from piles of furniture and boxes to a world built for the small people who will soon inhabit it. 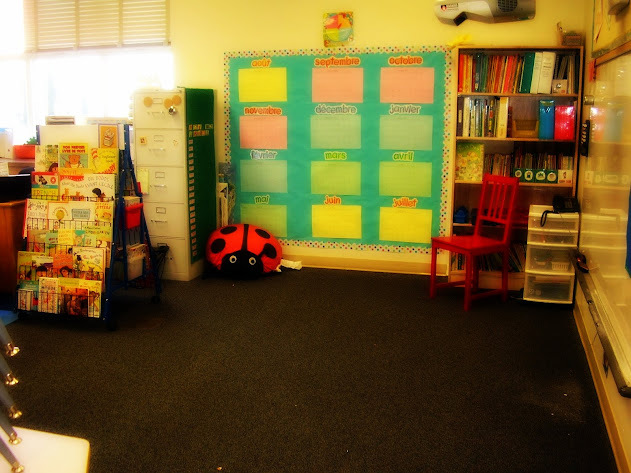 I even find magic in how, every day, our classrooms get torn into glorious messes, and then, with a few rounds of a cleanup song, a little big of nagging, a squirt of soap, a swish of a broom, they are reset, ready for tomorrow’s fresh start. But the greatest magic of all comes, perhaps, from this: from the care that we, as teachers, put into preparing our rooms every year. We are creating the space that will hold us and our students for 10 whole months, a space in which we will (hopefully) fall in love all over again: with a new group of children, with this amazing thing we have chosen to do with our lives. I am not a religious person, but for the years I worked at summer camp, I used to sometimes feel, as I was crossing the camp meadow, or walking the dusty road, that I was walking across the palm of a hand that held our camp family safe and happy. I had that same feeling today, puttering around my classroom. Yes, this is the place where we will come together and weave our world, the place where we will be we. Miss Night – What a wonderful description — “inviting and interesting and safe and soothing and stimulating”. As I prepare to return to my classroom next week and tackle the many tasks to ready the room for “my” children, I am so grateful for your insight and eloquence in sharing the magic of setting up an inviting place for learning and growing together. I am even more eager to re-create that magic. THANK-YOU. Oh, Jasmin, thank you so much. I have beent thinking a lot lately about how sacred our work is – almost like parents decorating a nursery for a long-awaited new baby. It is SO important to me that the kids feel good in our room, right from day one. I teach K (in California), and this is exactly what I’ve been doing the last few days. What a lovely way to describe the experience. Good luck, Matt! I hope it goes smoothly for you. You are setting up in a new school, correct? Overwhelming and exciting. Somewhere in the writing (and writing and writing) I did during my Masters, I wrote about my classroom being “hallowed ground”. I love how you wrote about your holy ground. And I’m another teachers who flits about the room doing a bit of this, moving to something else that catches my eye/heart and then back to another half started/finished project. I live in the hope that I will turn around at some point, and the room will be ready. Thank you, Sandi. What is most amazing to me is that that moment always does come – when I look up from one completed task and realize: “Whoa… I’m ready.” It’s always such a lovely surprise. Beautifully written again! You’ve captured how important our classrooms are to us and to our students. I also found it very reassuring to find out I’m not the only teacher who flits from area to area when setting up the room. Preparation of the environment is important in all grades, but especially so in the early years. Melva, every year, I start out thinking “I will start in THIS corner, and work my way around the room until I am DONE!” It never works out that way. Too many interconnected tasks, too many surprises left by cleaning crews and renovations.